The event hall (Pinon Room) for up to 200 guests, access to the kitchen and prep areas, & the Courtyard. Optional alcohol service is available. Access to the hall includes 12 hours from 9am - Midnight. Includes 70 6ft tables and 200 chairs, staffing for your event and basic cleaning. If you wish to serve alcohol add $250 to rental fee for security guard and contract with our concessionaire for the bar. 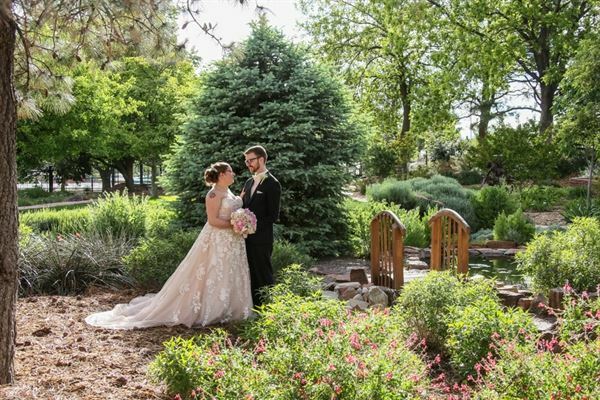 The entire facility including our beautiful gardens for your ceremony, our large reception hall, a smaller "bride" room, access to the kitchen and prep areas and the courtyard. Tables and chairs for the interior space is included. We provide security and basic cleaning. Renter must abide by all rules set forth in the contract. For planners wishing to serve alcohol there is a $250 additional rental fee. Planner must use the approved alcohol concessionaire. The Garden Package includes: - Garden Ceremony - Indoor Reception - Access to kitchen and prep areas - Bride's room - Courtyard. Facility access 9am - Midnight. Security and basic cleaning provided. Choice of caterer. Alcohol service available from Concessionaire. Must abide by all rules in the attached contract. Alcohol service adds $250 to rental fee plus renter must use the contracted concessionaire for the bar. All alcohol must be licensed. Renter may use caterer of choice. Prices include security for your event. Special Features: Lovely Gardens, Courtyard, Fountain, Pond, Gazebo, Kitchen.